Midwinter of the Spirit is both crime drama and horror show, an unsettling story that manages to take religion seriously while exploring the natures of evil and madness. 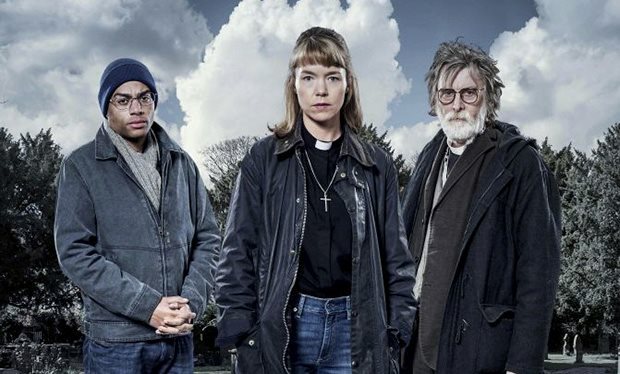 At the center of this three-part miniseries is Anna Maxwell Martin as the Anglican vicar Merrily Watkins. The widowed single mother is studying exorcisms as a means of dealing with the growing problem of fighting preternatural evil in a society that often denies its existence. While demonic evil may be treated with skepticism, no one doubts that human evil is capable of terrible crimes, especially when a prominent Satanist is found crucified in the woods. Mysterious suicides, mediums, officiously secular social workers, and dead birds enter the picture, crafting an increasingly twisty mystery with a gradually foreboding sense of malicious supernatural forces gathering strength. As Watkins investigates, she is faced with two interlocking challenges: to save her daughter, Jane, from intensifying adolescent anger, and to save her religious community from being taken over by Satanists. Martin provides her usual sterling performance as a woman trying to keep her life and faith together, but the show’s best and most memorable performances come from David Threlfall as a veteran clergyman and exorcism instructor, who provides a crusty but kindly presence as a man who understands human and demonic wickedness. David Sterne has a knack for playing humorously deranged character parts, such as his recent turn as the bizarre countryman in Detectorists. Here, Sterne plays Canon Dobbs, a man many of his fellow clergymen have written off as incurably insane; however, if sanity is defined as the ability to tell right from wrong, then Dobbs may just be one of the sanest people in the village. The ultimate reveal of the villains’ goals and the Big Bad requires an inductive leap on the part of the viewer, but this genuinely creepy and atmospheric production is definitely worth a look for horror and mystery fans.